Close to dusk on 2 April we trapped our first Ruby-throated Hummingbird of 2019, a second-year male banded locally last August (that's the new arrival, below left). We were excited to see and handle a hummer again and figured this individual would end up being our “Bird of the Week.” That, of course, was before we looked out the office window of the Center’s old farmhouse on the evening of 3 April and saw a woodpecker at a nearby suet feeder, where a moment before had sat a diminutive Downy Woodpecker. The new bird was noticeably larger than the downy and was not one of several Red-bellied Woodpeckers that also partake of our suet smörgåsbord. Nope, this bird was deep blue-black . . . with brilliant white wing patches . . . and completely red from the neck up. 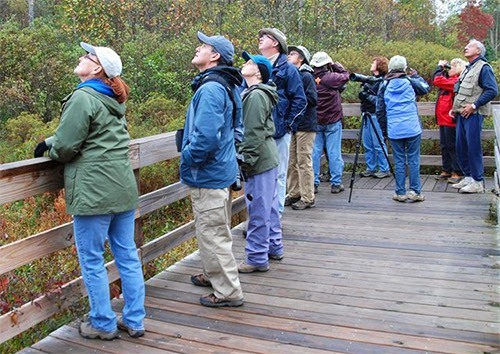 Yep, we were looking at what unmistakably was a Red-headed Woodpecker! "Why did that previous sentence end in an exclamation mark?" you might ask. Well, we could easily use !! or !!! or !!!! 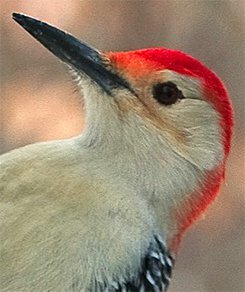 of them, and not just because Red-headed Woodpeckers might be the most eye-pleasing woodpeckers in North America (see below). The reason for our thrill was it was only the THIRD sighting of this species at the Center in 38 years, and the first time coming to a feeder! 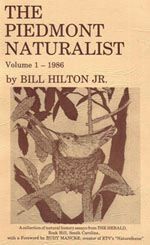 Our initial encounter here with Red-headed Woodpeckers (RHWO) was 'way back in March 1982 when we brought five-year-old Billy Hilton III down from Minnesota as we closed on this property that became Hilton Pond Center for Piedmont Natural History. That day we saw two RHWO pecking around on an old stump and considered them to be an omen of good things to come at our new locale. The second red-headed occurrence was in September 2014 when we watched one fly high over the pond while we were looking for migrating Common Nighthawks. Although quite colorful, Red-headed Woodpeckers are sexually monomorphic, with males and females identical in plumage and size. Even in-hand during breeding season they apparently can’t be sexed because both genders get brood patches and both help incubate and care for nestlings. 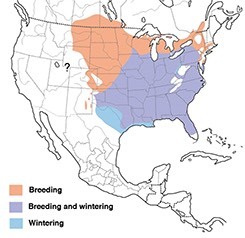 They breed and overwinter across the eastern U.S. (see range map at left, courtesy Birds of North America). Ornithologists admit RHWO are a difficult-to-study species for a lot of reasons, meaning there is much we do not know about these woodpeckers’ behavioral ecology. Although some Red-headed Woodpeckers are apparent year-round residents (see map), others migrate back and forth between winter sites in the South and breeding grounds further north. 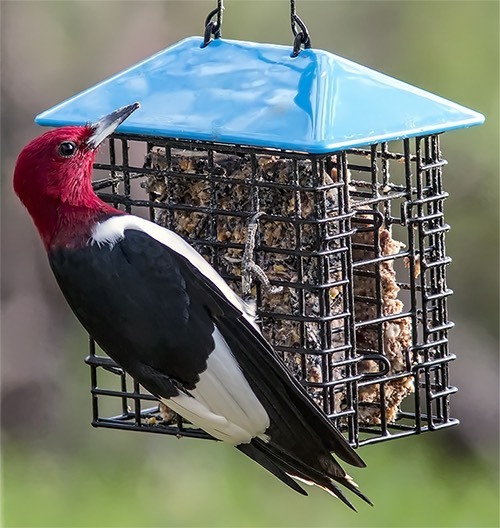 Thus, it’s possible our" red-headed was a “one-day wonder” that gorged on our generous suet offerings, but only while passing through in migration. Gambling that our RHWO—even if a migrant—would at least spend the night at the Center, we rose before dawn the morning after our initial sighting to deploy a mist net between the suet feeders the woodpecker had used. The strategy worked perfectly; at 8:15 a.m. the red-headed swooped from one feeder to another and got caught in the net. 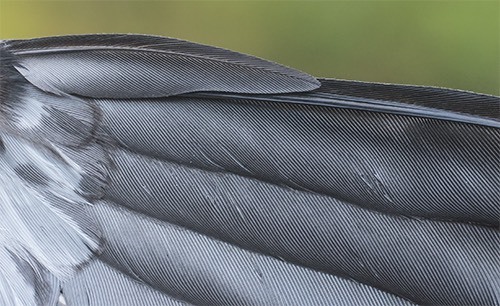 As we carefully removed this rarity from the soft mesh, we were reminded woodpeckers have several tools with which they can inflict pain on a well-meaning bander. 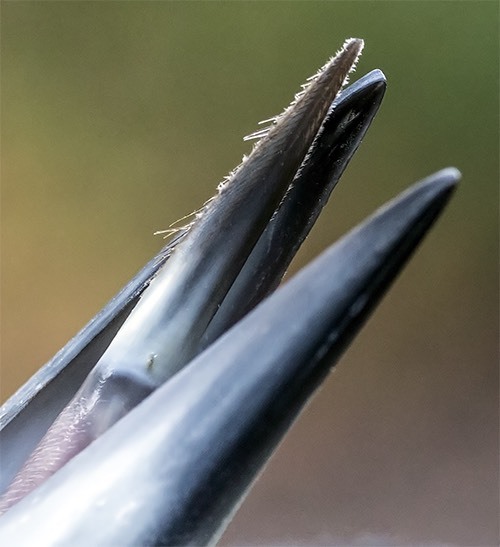 The most obvious is a heavy-duty chisel-shaped bill, well-adapted for excavating nests or feeding holes in tree trunks—and equally able to make puncture wounds in human skin. 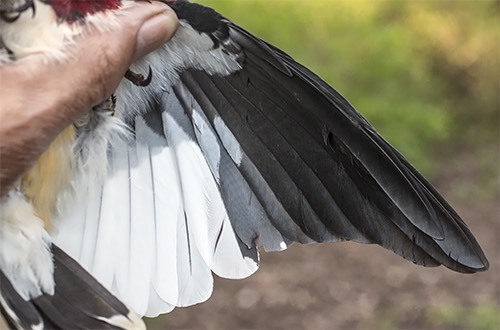 Even though we were able to avoid any pecking as we extricated the Red-headed Woodpecker and held it in the "bander's grip" (see photo above), its other weapons caused some pain as it scratched and dug into hands and fingers with eight sharply pointed decurved claws. Ouch! Fortunately, we were able to free the RHWO with minimal damage to our epidermis and brought it to the banding table for processing. Spectacular at the feeder, this brilliantly plumaged tri-colored woodpecker was even more breathtaking up-close. 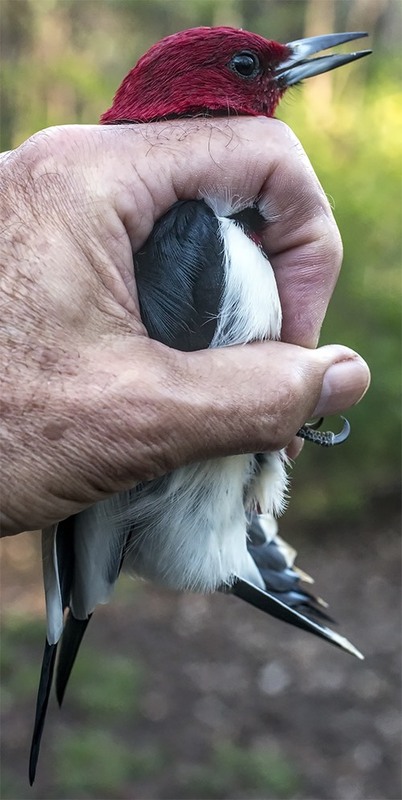 After banding was finished and measurements were made, discretion overtook vanity and we pulled on a glove—lest the RHWO peck and lacerate as we held it securely in the "photographer's grip" (above). Only twice before have we worn gloves to handle a bird, and they weren’t owls or hawks. The first was in Minnesota when we captured a feisty hook-billed Northern Shrike, and later in Belize when we saw stars from the vise-like bite of a Rufous-browed Peppershrike. 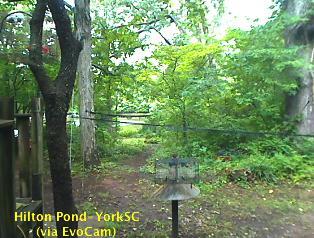 Upon release the Red-headed Woodpecker flew to a nearby tree, ruffled its feathers, and took off across Hilton Pond. It’ll be interesting to see if it hangs around, or if someday some bander within a more northerly part of its breeding range is startled to capture a RHWO with a band already on its left leg. 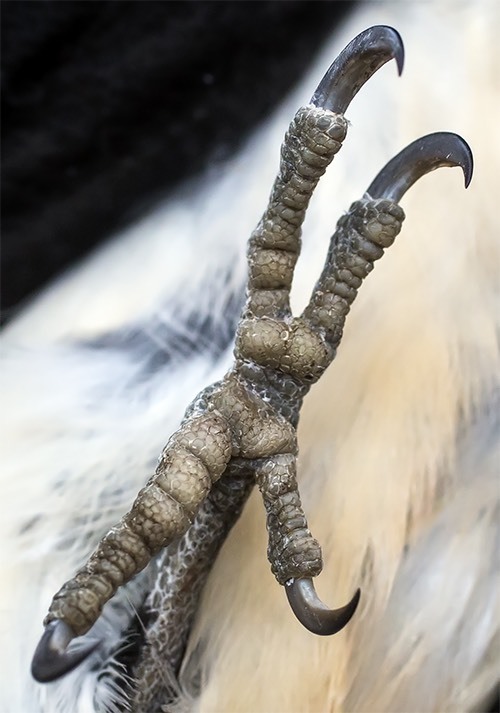 claws are strong and decurved--and VERY sharp! feathers that get a lot of use. secondary #1 having a lead edge of black. adds strength to the feather. 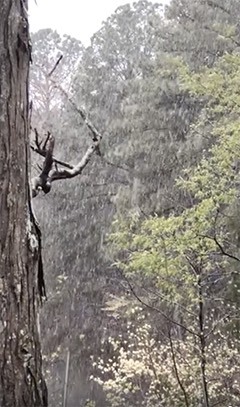 bird to extract its prey item. is the muscular tongue; contracting it reels in the catch. about the RHWO we caught! From the numerous photos above you can probably sense our excitement over finally capturing a Red-headed Woodpecker--now the 127th species banded at Hilton Pond Center since 1982! 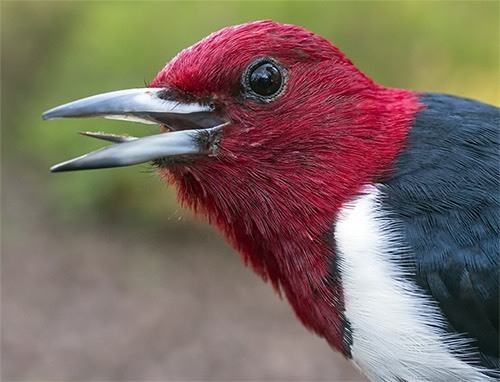 Even though Red-headed Woodpeckers can be locally common in optimum habitat—open deciduous woodlands, wetlands, or orchards and parks with lots of dead snags in which to excavate nest holes--their overall numbers have declined precipitously in recent years. For now we're happy to have seen and photographed just one--our 49th “Yard Bird” of 2019! 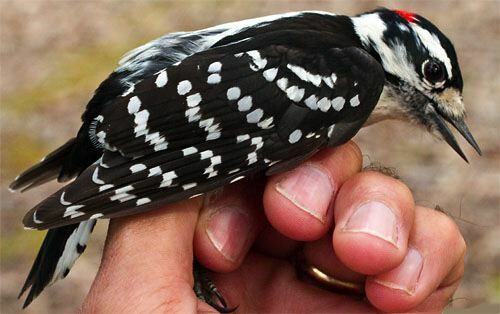 We were indeed stunned this week to catch what became our first-ever Red-headed Woodpecker banded at Hilton Pond Center, but that wasn’t the only member of the Picidae to hit our mist nets. 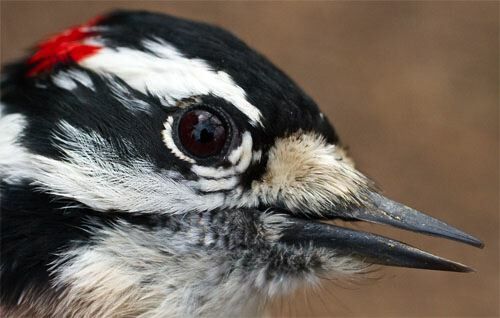 Although we also captured three Red-bellied Woodpeckers (two new ones, plus one recapture banded last year), the real startle came on 6 April 2019 when we caught NINE Downy Woodpeckers. Of these, four were new; from the remaining five, three were banded last year, one in 2017, and one—now a fourth-year bird—from 2016. The more important evaluation of our nine Downy Woodpeckers (DOWO) was that SEVEN of them were females, and all these were in breeding condition with well-developed brood patches that indicate they are currently incubating eggs, or possibly sitting on young. (That's a female downy above, lacking the red nape patch of the male.) Assuming DOWO have long-term monogamous pair bonds—which reportedly is the case—each of those seven females must have a male out there, which in turn means there are at least SEVEN pairs of Downy Woodpeckers at or very near Hilton Pond Center. This is especially remarkable when one source says a pair of downies may require a breeding territory of as much as 24 acres! Of the two male Downy Woodpeckers caught this week, one was new, and one was banded last year. 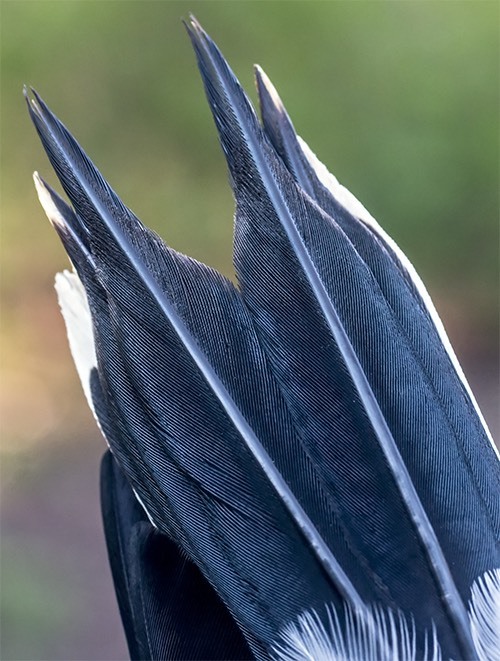 (Note the red nape patch of the male DOWO in the photos above and below.) We should mention both these males ALSO had brood patches, indicating that in this species both sexes incubate and brood. (The same is true of most of the 300-plus woodpecker species worldwide.) In DOWO, males usually take the night shift with eggs or chicks while the female occupies a roost hole nearby. 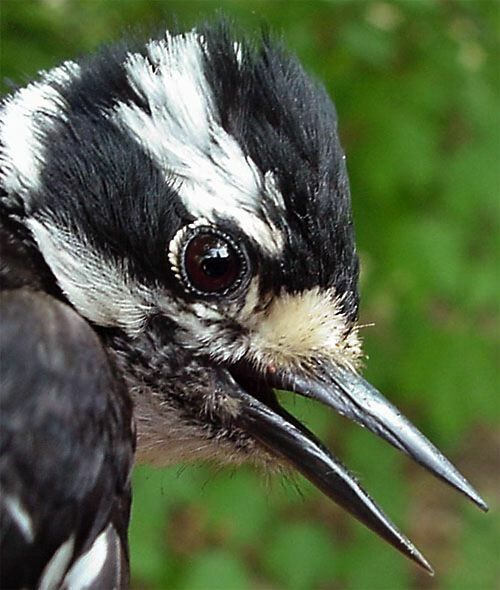 In 38 years at Hilton Pond Center we’ve banded 233 Downy Woodpeckers. It’s entirely possible the number of local downies will increase in coming years as hardwood trees on the property come of age and provide dead limbs for nest holes--and especially since we will continue to offer suet and other woodpecker sustenance on a year-round basis. For now, it will be interesting as we continue to run mist nets this spring to see whether more adult Downy Woodpeckers are captured, thereby indicating the local population is even bigger than what was documented by this week's take. Sometime before the month is out we anticipate seeing recent fledglings in the nets, proof their downy parents successfully shared duties in incubating eggs and raising young. With each pair capable of producing 3-8 eggs per clutch, there could be a LOT of those little woodpeckers buzzing and pecking around Hilton Pond very soon. 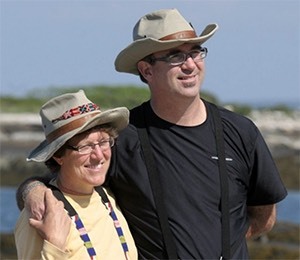 Let’s see, eight chicks times seven pairs of Downy Woodpeckers equals . . . .
Bill (below left with writer/artist/musician wife Julie Zickefoose) died far too young of pancreatic cancer at age 57, but not before making major impact on the art of birding. 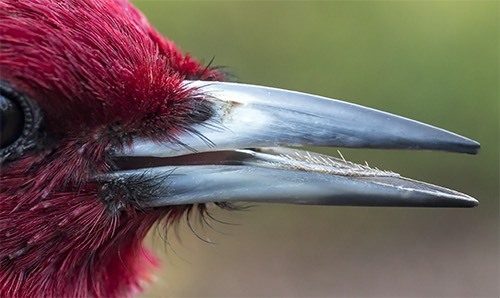 He traveled far and wide as an advocate for birds and bird conservation and education, observing many exotic avian species the rest of us see only in photographs. Despite his far-flung adventures, when he returned to the family farm near Whipple, Ohio, he steadfastly maintained his favorite bird was the home-grown Red-headed Woodpecker. 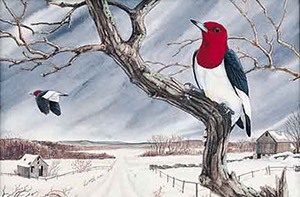 As a scientist I objectively examined the Red-headed Woodpecker I caught and banded this week, but my spiritual side makes me wonder if the unexpected arrival at Hilton Pond of BT3’s favorite bird shortly after his passing was more than coincidental, or even a little supernatural. I always say in nature “everything is connected to everything else,” but maybe those connections don’t stop when an organism ceases to function on this planet. Maybe Bill was . . . .
As I study birds and nature at Hilton Pond I do what I can on behalf of wildlife, trying to make this place the best bird feeding station around. I thought about all that this week when I caught BT3’s favorite bird and I wonder, just wonder . . . .
--On the morning of 2 Apr 2019 Hilton Pond Center received a predicted but still surprising snow event--nearly an inch of heavy wet stuff that laid a light blanket of white on the substrate. Snowflakes against a backdrop of yellow Forsythia blossoms and white Flowering Dogwoods (above) created a delightfully incongruous image. Within a few hours the spring snowfall began to turn to slush and mix with copious amounts of tree pollen, giving new meaning to the phrase "yellow snow." 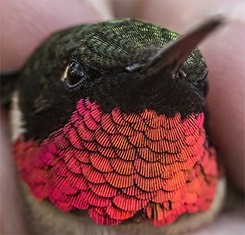 --No unbanded Ruby-throated Hummingbirds have appeared yet this spring through 7 Apr at the Center, although a banded male from 2018 did show up on 2 Apr this year. (See photo in the essay above.) 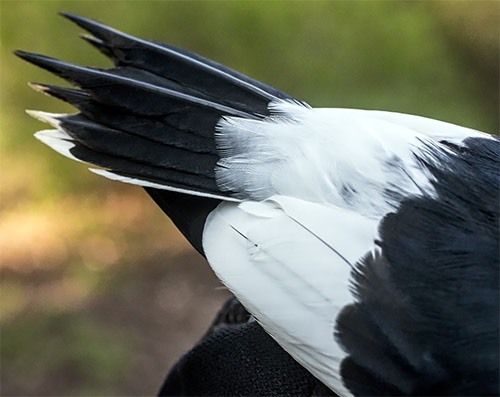 Our earliest arrival since we began studying RTHU in 1984 was a banded male on 26 Mar 2015, while our earliest unbanded individuals were on 27 Mar in four different springs. Every year is a little bit different, so we never know exactly what to expect from these enigmatic little long-distance migrants. --As of 7 Apr, the Center's 2019 Yard List stood at 50--about 29% of 171 avian species encountered locally since 1982. (Incidentally, all 50 species so far this year have been observed from the windows of our old farmhouse! If you're not keeping a Yard List for your own property we encourage you to do so, and to report your sightings via eBird. You, too, can be a "citizen scientist.") New species observed during the period: Ruby-throated Hummingbird, Red-headed Woodpecker, Blue-gray Gnatcatcher. --Our immediate past installment of "This Week at Hilton Pond" was about a visiting Osprey and a banded Purple Finch banded elsewhere by someone else and is always available on the Center's Web site as Installment #690.